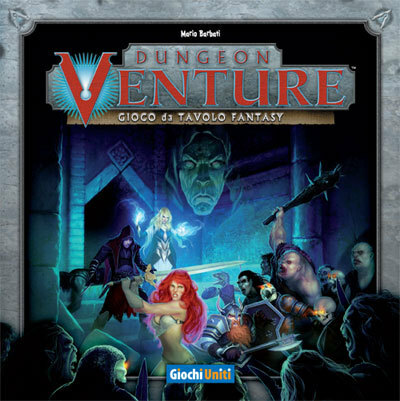 The game is organized in quests (10 in the Adventures booklet but, hopefully, more will be available on-line in the future) that can be played as a full campaign. The will to lay a bridge in the direction of the RPGs is evident and the designer itself has a long career has RPG master. The box include a lot of materials: rules, adventure booklet, hero sheets, counters, tiles, more than 50 monsters counters, cards (a lot). Unluckily no plastic miniatures but plastic bases for the heroes and monsters counters and 19 special dice. The work to make a real simple game is evident, taking the best from what the genre can offer (like the idea of different dice), adding something new. The map is prepared according to Quest instructions using map tiles squared gridded. All the map is known before the start of the adventures but monsters and traps are put in play only when the relative dungeon section is entered. The 4 Heroes are described by attack, defense, mana, life points and movement. Attack and defense indicate number and type of dice rolled in attack/defense. There are 3 different dice: red (4 success), blue (3 success) and green (2 success). The attack range from the 2 green of the Mage to the 3 blue and 1 green of the Barbarian. Characters move 6 spaces (only the dwarf move 5). Mana is first used to determinate the maximum number of spells and sometimes for spell effects. The Mage will start with 3 selected spells, all other characters have to find. The stats of the 4 characters are enough vary to have an idea of playing something different and also some equipment and spells found in the adventure can be used only by some characters. 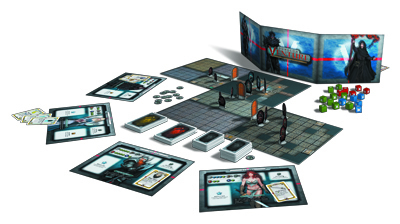 The game is played in turn: first a card from the initiative deck is revealed. The deck is made of the characters card and the card of all the monster actually in play. The revealed character/monster will take is turn that will consist in movement+action or action+movement. Than another card is revealed and so on. This is one of the nice idea in the games: having a random turn will create different situations and, without added complexity, will constrain players to change their strategy. You always have to remember than DV is a game for introducing players to adventure games and so everything has been designed to keep the rules as easy as possible. The most common actions players will do is attack. The attacker roll dice according to his stats and equipments and the defender does the same. If the attacker got more success than the number in excess are the wounds inflicted: just one roll to resolve the attack. Other possible actions include open/close doors, search (to find traps and secret doors), use cards (including spells) and pick-up objects. How the game flow is nice: the characters have to cooperate to win and the Evil Keepers has to use his monsters at the best. The game is easy and simple and the decisions to take not too much. Randomness (both in dice rolls and treasures) has an important impact. Killing a monsters get to the character a random card from the monsters deck that include spells, equipments and consumables (potions). Which objects characters gain during the quest will change a lot the proceeding: a bow is really different that getting a sword and spells are not all the same. Are the quests really different ? Yes, they are. Monsters and map are differents and furnitures and traps will change how the same “map” will be used. The same quest can’t really be played more times since the position of monsters and traps is already known, spoiling part of the fun and giving characters an evident advantage. On the other side it will be not too much difficult to invent new quests and the materials (monsters and treasures) included in the box are enough. What I really miss is the possibility to choose from more characters: I think it will be not difficult to include in the box 2-3 more characters along with the Mage. Rogue. Barbarians and the Dwarf Warrior. When played with less than 5 person heroes players will use more than one hero since all the quests are designed to be played by 4 characters. This something I don’t like too much: it will be much more better to include some rules do adjust the difficulty level according to the number of players involved. Dungeon Venture is a semi-cooperative game with heroes players fight against the Evil one and it is good to be played in family (dad against the kids!). Of course it is a simple game best suited as introduction to adventure games: if you are looking for something to play with your friends in a late-night session look for something else (like Runebound or Descent), but if you are looking for the next step after HEROICA and interested in something different from Talisman, Dungeon Venture could be a nice opportunity. The campaign rules are really simple but nice, introducing a sort of evolution in the party. We will see in the future how the game will be welcomed and if the publisher will be interested in expansions (characters, treasures, adventures, enemies, …) that can keep it alive.